STANDARD CONNECTORS ARE GLASS FILLED THERMOPLASTIC RATED TO 390 DEG F. PLUGS HAVE THERMOCOUPLE MATERIAL PINS AND JACKS HAVE THERMOCOUPLE MATERIAL SPRINGLOADED INSERTS. STANDARD DUPLEX CONNECTORS ARE GLASS FILLED THERMOPLASTIC RATED TO 390 DEG F. PLUGS HAVE THERMOCOUPLE MATERIAL PINS AND JACKS HAVE THERMOCOUPLE MATERIAL SPRINGLOADED INSERTS. 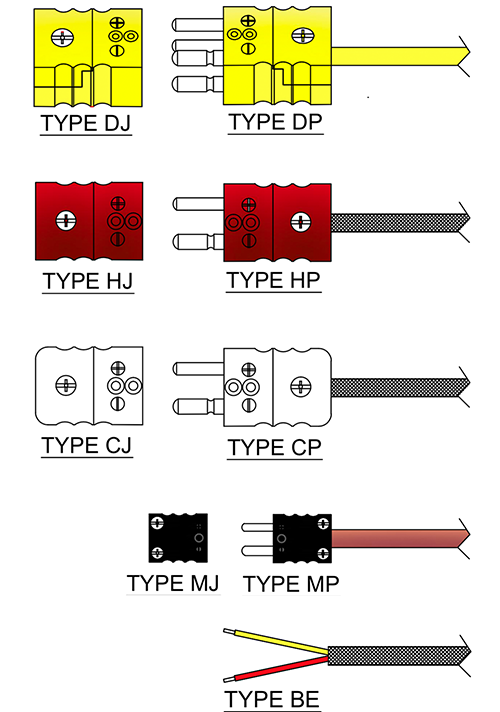 HI TEMP CONNECTORS ARE THERMOSET RATED TO 690 DEG F. PLUGS HAVE THERMOCOUPLE MATERIAL PINS AND JACKS HAVE THERMOCOUPLE MATERIAL SPRINGLOADED INSERTS. CERAMIC CONNECTORS ARE RATED TO 1,200 DEG F AND PLUGS HAVE HAVE THERMOCOUPLE MATERIAL PINS AND JACKS HAVE THERMOCOUPLE MATERIAL SPRINGLOADED INSERTS. MINI CONNECTORS ARE GLASS FILLED THERMOPLASTIC RATED TO 390 DEG F. PLUGS HAVE THERMOCOUPLE MATERIAL PINS AND JACKS HAVE THERMOCOUPLE MATERIAL SPRINGLOADED INSERTS.